Sri Lanka looked jaded, lost and needed a lot of inspiration heading into their tour of South Africa. They were completely outclassed in Australia and New Zealand and came into this series with very few people giving them a chance to cause any hiccups. They sacked and dropped their underwhelming captain Dinesh Chandimal and their senior batsman Angelo Mathews for the tour of South Africa. Dimuth Karunaratne was named their captain. With nothing going in their favor and a full strength Proteas side, we were headed for yet another annihilation for Sri Lanka in an overseas series. But what followed was sheer bliss for Test cricket. Sri Lanka had a very young and inexperienced bowling attack, led by the hard-working Suranga Lakmal. With bowlers like Vishwa Fernando, Kasun Rajitha, Lasith Embulldeniya, and Dilruwan Perera pitted against Dale Steyn, Kagiso Rabada, Vernon Philander, Duanne Olivier, it was clear that the Proteas were way better. But in a surge of confidence and just by sticking to the basics, the Lankan lions exposed the weakness of the Proteas batting lineup and they started crumbling. Only Aiden Markram, Faf Du Plessis, and Quinton De Kock played with some conviction. The Sri Lankan bowlers stuck to their basics and kept hitting the right length, and the swing caused a lot of trouble and anguish for the Proteas batsmen. They fell like a pack of cards and allowed Sri Lanka to script history. Sri Lanka played above their weight in the first Test match at Durban with debutant Lasith Embuldeniya, and youngsters Vishwa Fernando and Kasun Rajitha constantly got results with the ball. The young Lankan batsmen were asked to chase down a huge target of 304 runs. It was a very tough ask and it required a superlative batting performance from their batsmen to create history. It was then that we got to witness one of the finest innings in Test cricket from Kusal Janith Perera. Kusal Perera was joined by Dhananjaya de Silva when the score was at a precarious 110-5, with the Lankans need a further 204 runs to overpower South Africa. These two batsmen put their heads together and the result was a 96-run partnership. 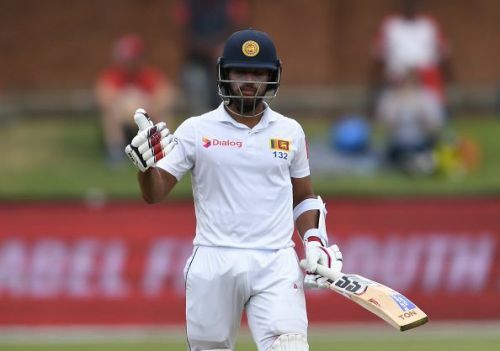 Post Dhananjaya De Silva's dismissal, Kusal Perera knew that he was the only hope if Sri Lanka were to win this test match and he was not helped by the fact that the tailenders didn't stay with and support him. Suranga Lakmal, Kasun Rajitha, and Lasith Embulldeniya could hardly add any runs to the target before getting dismissed. This left the tourists with 78 runs to get and only Kusal Perera and Vishwa Fernando left in the way of another routine South Africa victory. But what followed was sheer brilliance from Kusal Perera in an astonishing display of Test match batting. Kusal Perera had a rather risk free path to his century. Post that, he took his chances, with only Fernando at the other end. With the target inching closer, the batsmen in the middle held their nerve marvelously and managed to create history. Kusal Perera's knock of 153 not out would go down as among the best knocks ever played because of the bowling attack he was facing, the pitch conditions and most importantly with the match situation. It's not easy to be in complete control of your game when the number 11 batsman is up against the likes of Dale Steyn and Kagiso Rabada. A brilliant, memorable Test match and undoubtedly the Lankan lions who needed inspiration before coming into this series found that within their team in Kusal Perera. With Faf du Plessis praising his performance- need we say more? South Africa have been struggling to put on competitive scores for their bowlers to play with. Their lack of big partnerships and definitive knocks from big names like Hashim Amla, Dean Elgar, Temba Bavuma and Aiden Markram has hurt them badly. Only Faf du Plessis and Quinton De Knock showed some fight and determination. Full credit must go to the Sri Lankan bowling attack with everyone stepping in and putting on a show. They bowled the right lines and lengths and got the ball to do just enough to expose the technical deficiencies that have crept into the Proteas batters. The biggest highlight was the left arm seamer, Vishwa Fernando. He was instrumental in scripting history at Durban and swung the ball consistently throughout the series. Vishwa Fernando picked up two four-wicket haul and finished with 12 wickets in the series. Sri Lanka created a history of their own by becoming the first Asian team to win a Test series in South Africa. India came close on their last tour but Sri Lanka were clearly outstanding and a class apart to whitewash a strong Proteas side. Who said Test cricket has lost its sheen? Who felt Test cricket is losing its credibility and value amidst the increasing popularity of T20 cricket? The recent results prove that Test cricket is the real deal and nothing can beat the thrill and excitement of watching and following a hard fought game of Test cricket!